Salman Khan unveils the first ever poster of Notebook which is all set to release on 29th March 2019. The 53-year-old actor, who has played mentor to many in Bollywood, is now introducing Pranutan Bahl and Zaheer Iqbal in Notebook. If’s Zaheer Iqbal is the son of Iqbal Ratnasi, an old acquaintance of Salman, Pranutan in Mohnish Bahl’s daughter. Salman and Mohnish worked together in hit films like Maine Pyaar Kiya, Hum Aapke Hai Kaun and Hum Saath Saath Hain. On Valentine’s Day, Salman Khan shared a first look on twitter, in which he told, “Bina mile kabhi pyaar ho sakta hai? 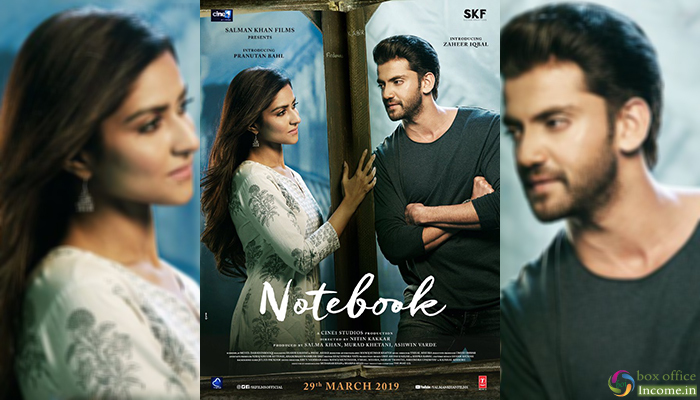 Introducing @PranutanBahl & @iamzahero in this unique love story directed by @nitinrkakkar #Notebook, releasing 29th March 2019, trailer out on 17th Feb”. The actor himself took to Twitter and shared the first look poster with fans. He wrote, “Presenting to you the first chapter of our #Notebook… Pehli har cheez yaadgaar hoti hai, pehle yeh sirf meri thi, ab aap sabki hai ❤🙏 Trailer out on 17 Feb”. While Pranutan is clearly overwhelmed and put “First film, first poster..Everything is special today? Excited and thrilled to share the first chapter of our #Notebook ❤️ Hope you all like it!! Trailer out on 17th February? ?❤️❤️” as her caption to another post. The makers have shot a few portions of Notebook in the picturesque Kashmir valley and will continue the next schedules in Mumbai. Directed by Nitin Kakkar, besides Salman, Notebook is also produced by Murad Khetani and Ashwin Varde jointly..